The Macon County Conservation District is committed to providing enriching educational opportunities for students and educators of all kinds: classroom teachers, homeschoolers, and youth group leaders. The District offers materials for classrooms, field trip destinations, Mobile Nature Center presentations, and assistance with scout badge workshops and requirements. We’re an extension of your classroom. Our nature programs for all grade levels complement your science curriculum with hands on learning. 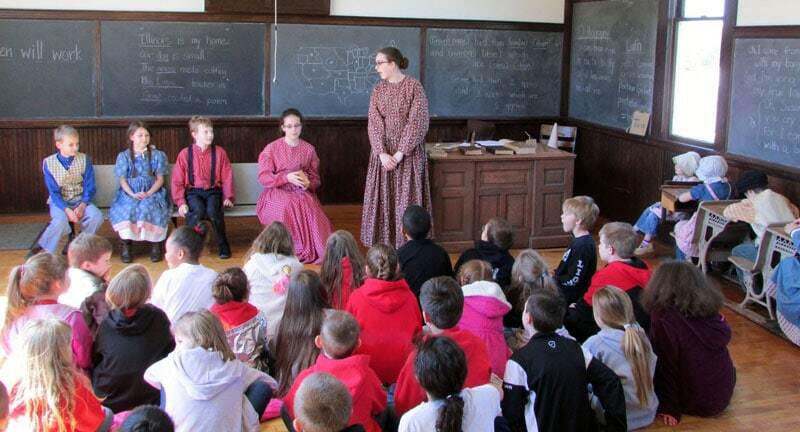 Our living history programs teach children from pre-kindergarten through college about pioneer life on the Illinois prairie. All tours, presentations, and programs are adapted according to the age and needs of your group and align with Common Core and Next Generation Science Standards. The exact standards enhanced by the experience will vary depending on the content of the program, your students, and how you use the experience. These learning opportunities are perfect for: schools, home-school groups, after school programs, organized groups, scouts, retirement communities, libraries, day care centers, and camps. All programs can be held at Rock Springs Conservation Area. Many can also be held at Griswold, Sand Creek, Friends Creek, and Fort Daniel Conservation Areas, or at your location. General Information: How to make reservations for field trips and programs, when to visit, what to wear, and more. Presentations: Let us bring an indoor nature or history program to you. No travel required! Or schedule one of these as a field trip. Lending Trunks: Borrow one of the Illinois Department of Natural Resources teaching kits. Tips for a “Greener” Field Trip: Do your part to take care of nature by trying out these tips for a greener field trip. Mobile Nature Center: We’ll organize a unique learning experience at your location. We can bring and operate telescopes, an inflatable mobile planetarium, and more. Field Trips: Immerse your group in nature with a hike at a conservation area, step back in time by visiting a historic site, and more! Museum in a Box: Borrow one of these teaching kits assembled by Conservation District staff, to supplement your own lessons. The Educator’s Guide is available to all teachers. If your school hasn't received one or you would like extra copies, call us at 217-423-7708.